One of the first purchases you’ll make for your infant is that of a mattress. Though you may choose to co-sleep (we did), eventually you’ll make the switch to a toddler bed. The traditional mattress is covered with chemical flame retardants. Flame retardants are made from volatile organic compounds (VOCs) that are linked to respiratory issues, headaches, allergies and cancer. There is concern that these chemicals are also linked to SIDS. These VOCs have been found in both cord blood and in human blood.In fact, in 2014, the University of Texas did the first ever study of its kind and found that infants are exposed to high levels of chemical emissions from crib mattresses while they sleep. The ideal mattress is one made from truly organic and natural materials – one made from organic cotton, latex derived from the rubber tree (completely different than synthetic latex) and wool. Wool is a natural flame retardant, no chemicals needed! Many mattresses contain glues and man-made fills that are toxic. This is especially the case for any type of foam – even soy foam! Mattresses made from soy or bamboo are heavily processed. 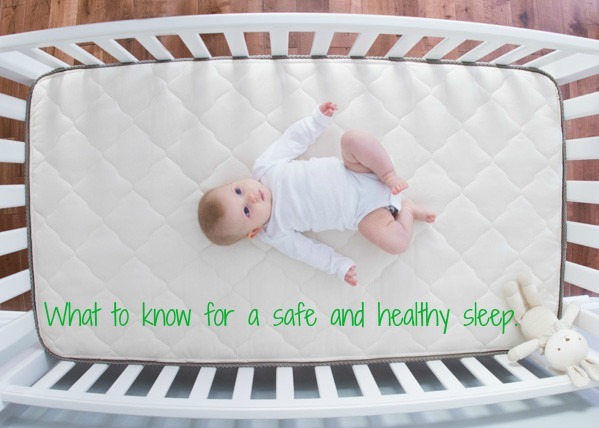 Your infant/toddler will spend 10 to 12 hours sleeping on it cheek to mattress. That’s 50% of their little lives. Making sure it’s one not covered in chemicals or made from materials that aren’t natural is important so that they are breathing in only what you want them to – air! While some companies claim that their mattresses are natural or organic, they aren’t telling you the whole truth. Many of these companies are only referring to the outside most layer of the mattress. You must read the fine print. If there is no explanation of the materials used, you can always call the company to ask exactly what the composition of the mattress is. Ideally, you want your organic mattress to have a certified third-party certification. Two of many examples of companies that lead people to think that their mattresses are all organic or all natural are Pottery Barn with their Kids Lullaby Organic Crib Mattress and Naturepedic with their No Compromise Crib Mattress. Pottery Barn calls their mattress organic, but not all layers are. In fact, they use a non-organic, GMO soy foam. In reality, soybean foam is primarily made from petrochemicals, not soybeans. So you are getting a nice combination of, well, crud. Tim, the owner of My Green Mattress, named this after his daughter, for whom he made his very first organic mattress for. Shortly after Emily was born, it was apparent that she suffered from eczema and allergies. Tim and his wife took Emily to see the best pediatric dermatologists, but also did their own research and found that all-natural products could help alleviate Emily’s symptoms. 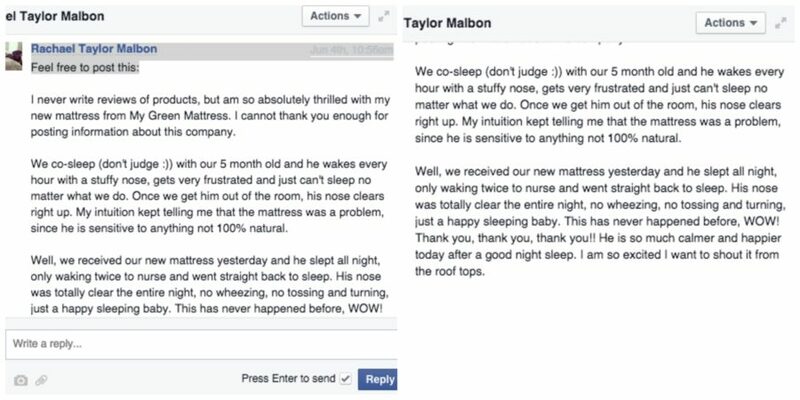 Tim realized it was time to offer all-natural mattresses to his customers, putting the first one in his daughter’s crib. ***Please note that since he started making them some years ago, his mattresses are now officially GreenGuard GOLD certified AND both the cotton and wool are processed using GOTS certified materials and techniques. In addition, neither the wool or the cotton are blended. GOTS certified organic cotton and natural wool quilted cover. ***Important info: My Green Mattress does NOT combine their wool or cotton with any other fibers and unlike other companies, their wool is cleaned in an alcohol-based solution that is GOTS compliant. **The wool in the quilted cover acts as a natural flame barrier, therefore the mattress passes flame testing required by law without the use of dangerous flame retardant chemicals. In addition, wool is naturally resistant to mold, mildew, and dust mites. *Please note, after finding My Green Mattress on my own accord when looking for safe mattresses for my family, I purchased two and loved them. After owning them for some time, the company reached out to see if I would like to become an affiliate. I do not partner with many companies, but I said yes right away to them as I was sharing about the mattresses anyway. The small percentage I make helps me to continue the work I do with the blog. Thank you for supporting this blog. « Make this Nutrient Dense Lamb Stew in an Instant! Do you have the natural escape mattress? We currently bought a mattress online that had such a terrible smell…I was alarmed and read it was made mostly from polyurethane. I am currently in the return process and will probably be buying the natural escape. I did read that it has a smell as well. What was your experience? Do you use a mattress protector with the Emily mattress?